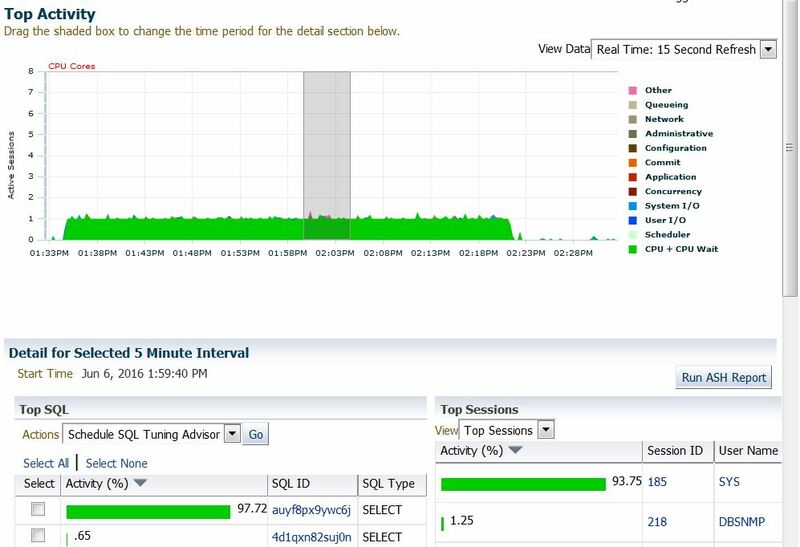 Everyday, at the same time, and for 20-40 minutes, the servers hosting the Oracle databases run literally out of CPU. Ok, it would be too easy to give the solution now. If you cannot wait, jump at the end of this post. But what I like more is to explain how I came to it. It seems that the source of the problem is not a single database, but all of them. Isn’t it? 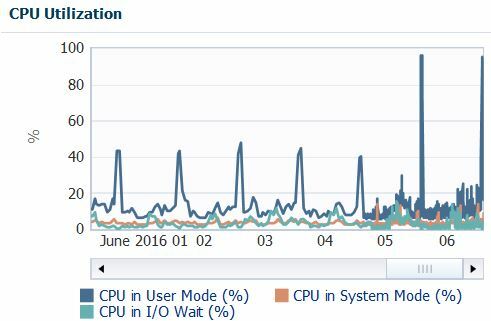 And I see another pattern here: the CPU usage comes always from the [m001] process, so it is not related to a user process. It looks like something made by a DBA, but it comes from the MMON. DBMS_FEATURE_AWR function calls internally the SQL auyf8px9ywc6j. In his blog post, he points out that the query fails because of error ORA-12751 (resource plan limiting CPU usage) and that it is a problem of Adaptive Dynamic Sampling. Is it true? What I like to do when I have a problematic sql_id, is to run sqld360 from Mauro Pagano, but the resulting zip file does not contain anything useful, because actually there are no executions and no plans. SQL> select sql_id, child_number from v$sql where sql_id='auyf8px9ywc6j'; SQL_ID CHILD_NUMBER ------------- ------------ auyf8px9ywc6j 0 SQL> select * from table (dbms_xplan.display_cursor('auyf8px9ywc6j',0, 'ALL +NOTE')); PLAN_TABLE_OUTPUT ------------------------------------------------------------------------------------------------------------------------------------------------------------------------------------ SQL_ID auyf8px9ywc6j, child number 0 WITH SNAP_RANGES AS (SELECT /*+ FULL(ST) */ SN.DBID ,SN.INSTANCE_NUMBER ,SN.STARTUP_TIME ,ST.STAT_ID ,ST.STAT_NAME ,MIN(SN.SNAP_ID) AS MIN_SNAP ,MAX(SN.SNAP_ID) AS MAX_SNAP ,MIN(CAST(BEGIN_INTERVAL_TIME AS DATE)) AS MIN_DATE ,MAX(CAST(END_INTERVAL_TIME AS DATE)) AS MAX_DATE FROM DBA_HIST_SNAPSHOT SN ,WRH$_STAT_NAME ST WHERE SN.BEGIN_INTERVAL_TIME > TRUNC(SYSDATE) - 7 AND SN.END_INTERVAL_TIME < TRUNC(SYSDATE) AND SN.DBID = ST.DBID AND ST.STAT_NAME IN ('DB time', 'DB CPU') GROUP BY SN.DBID,SN.INSTANCE_NUMBER,SN.STARTUP_TIME,ST.STAT_ID,ST.STAT_NAME ) ,DELTA_DATA AS (SELECT SR.DBID ,SR.INSTANCE_NUMBER ,SR.STAT_NAME ,CASE WHEN SR.STARTUP_TIME BETWEEN SR.MIN_DATE AND SR.MAX_DATE THEN TM1.VALUE + (TM2.VALUE - TM1.VALUE) ELSE (TM2.VALUE - TM1.VALUE) END AS DELTA_TIME FROM WRH$_SYS_TIME_MODEL TM1 ,WRH$_SYS_TIME_MODEL TM2 ,SNAP_RANGES SR WHERE TM1.DBID = SR.DBID AND TM1.INSTANCE_NUMBER = SR.INSTANCE_NUMBER AND TM1.SNAP_ID = SR.MIN_SNAP AND TM1.STAT_ID = SR.STAT_ID AND TM2.DBID = SR.DBID AND TM2. NOTE: cannot fetch plan for SQL_ID: auyf8px9ywc6j, CHILD_NUMBER: 0 Please verify value of SQL_ID and CHILD_NUMBER; It could also be that the plan is no longer in cursor cache (check v$sql_plan) 22 rows selected. 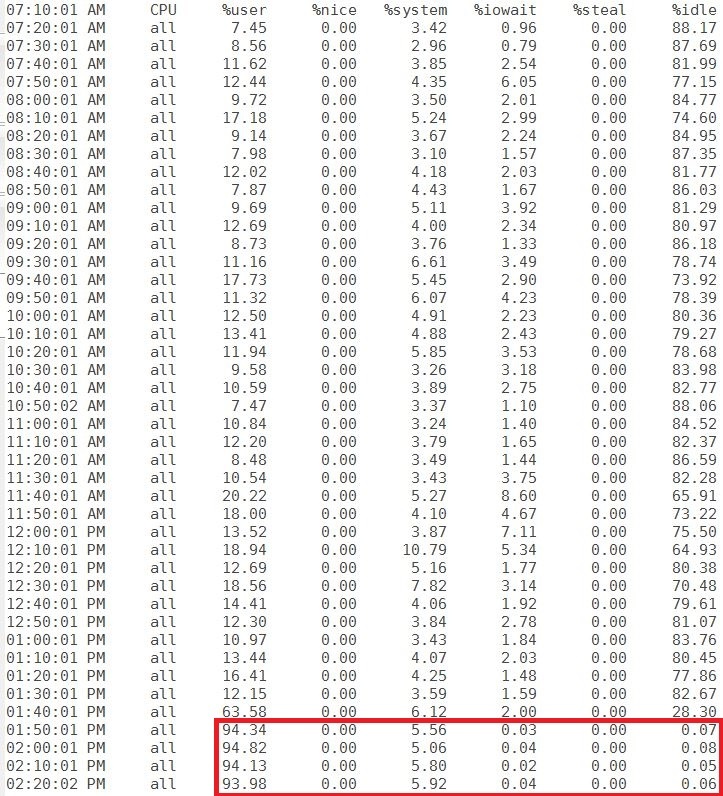 SR.STAT_ID AND TM2.DBID = SR.DBID AND TM2. And this is very likely because the statement is still parsing, and all the time is due to the Dynamic Sampling. But because the plan is not there yet, I cannot check it in the DBMS_XPLAN.DISPLAY_CURSOR. So, there are some SQL Plan Directives that force the CBO to run ADS for this query. At this point, the solution is the same already pointed out in one of my previous blog posts: disable the directives individually! This very same PL/SQL block must be run on ALL the 12c databases affected by this Adaptive Dynamic Sampling problem on the sql_id auyf8px9ywc6j. If you have just migrated the database to 12c, it would make even more sense to programmatically “inject” the disabled SQL Plan Directives into every freshly created or upgraded 12c database (until Oracle releases a patch for this non-bug). It comes without saying that the next execution has been very quick, consuming almost no CPU and without using ADS.